We all hate it when we find ourselves reapplying our lip product continuously throughout the day so that's why most companies have a long lasting range with Maybelline being no exception. 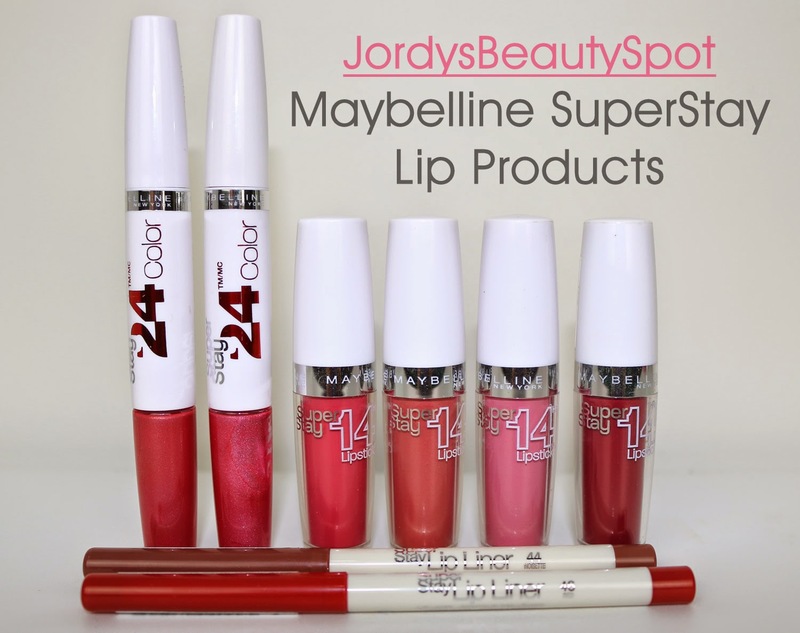 I wanted to put the Maybelline SuperStay range to the test and let you all know what I think that way if you have been looking for a lip product that lasts a long time then hopefully this can help. With claims of lasting 24 hours, this product is by far the one with we expect most from and it definitely delivers. The dual action of applying the long lasting lip colour then sealing it with a balm results in colour that lasts all day; from the time you apply it in the morning before work to when you are taking your makeup off at night. This product retails for $21.95 which seems like quite a lot for drugstore but when you think about how much product you save by not having to reapply it then you can see it's worth. My only critique about this product is that it has a tendency to crease in the natural cracks on my lips and although the colour does in fact last, it starts to look a little dodgy by the end of the day. Moving down the scale of long lasting, the estimated staying time of this lipstick range is nearly half that of the liquid lipstick. I suppose that it is to be expected though as this product does not have a finishing balm to put over the top, instead relying on a thick and tacky consistency to last a longer duration than your usual lipstick. These lipsticks definitely do last an impressively long time but similarily to the liquid lipsticks, they have a tendency to accentuate the lines/cracks in my lips and as the hours progress, the crispness and freshness begins to deteriorate and look a little more faded. Although there is no certain duration of estimated lasting time it can be assumed, as part of the SuperStay range, that the liner will last as long as the lipstick you plan to use it with so around 14 hours. I actually really love these liners because I find that they don't feather or bleed into the lines around your lips and they stay put all day. Something that is applicable to all three of these products it that they are quite drying which is to be expected with most long lasting ranges. I have tried products that are much more drying than these but I thought I would just mention it that way you are aware before buying them that they aren't creamy or moisturising in any way. The prices provided are at full cost but you will often find these products on sale, as an example Priceline is currently having 20% off Maybelline. So you will find that you can get these products at quite an affordable price if you look around for sales. So the verdict, I think that if you're looking for a long lasting lip product then this range is definitely worth checking out. Despite it's downsides such as being drying and fading after a while, I personally think that it's the best quality you're going to get from the drugstore otherwise you would have to look into MAC Pro long wear lipsticks which are much creamier but also a lot more expensive. I found the Liquid Lipstick very drying! Though it did stay on. But you'll have to use a lip treatment right after you take it off. It was like painting your lips. I have both of those lipsticks. The SuperStay 14hr I actually like. It's not the creamiest or most moisturizing lip product but it's not the most dry either. I find it comfortable enough and it looks nice so I do reach for it quite a bit. The Superstay 24hr liquid lipstick I really don't like. Like Charlie above said, it is very drying. Plus I hate how this product wears away. Every time I've used it, after a while it cracks and crumbles away especially in the middle of the bottom lip. There are better long lasting lipsticks than this so I will not repurchase. I completely agree! It's definitely a toss up between longevity and being comfortable. Disappointing that they couldn't make it nicer to wear on the lips.